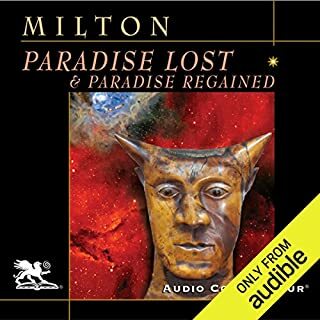 John Milton's Paradise Lost is one of the greatest epic poems in the English language. It tells the story of the Fall of Man, a tale of immense drama and excitement, of rebellion and treachery, of innocence pitted against corruption, in which God and Satan fight a bitter battle for control of mankind's destiny. 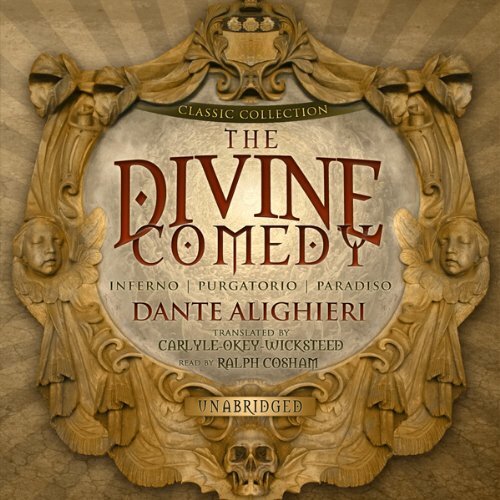 Dante's Divine Comedy is considered to be not only the most important epic poem in Italian literature, but also one of the greatest poems ever written. It consists of 100 cantos, and (after an introductory canto) they are divided into three sections. Each section is 33 cantos in length, and they describe how Dante and a guide travel through Inferno, Purgatorio, and Paradiso. This critically acclaimed translation was awarded the Los Angeles Times Book Prize for Poetry and the Harold Morton Landon Translation Award given by the Academy of American Poets. 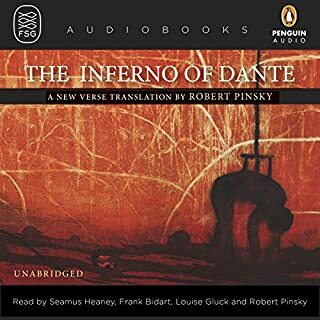 Well versed, rapid, and various in style, the Inferno is narrated by Pinsky and three other leading poets: Seamus Heaney, Frank Bidart, and Louise Glück. For thousands of years, Homer's ancient epic poem the Iliad has enchanted readers from around the world. 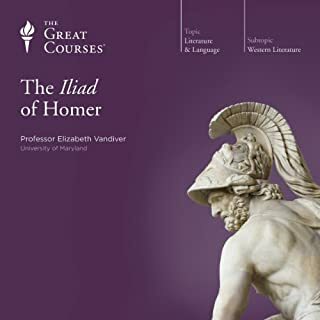 When you join Professor Vandiver for this lecture series on the Iliad, you'll come to understand what has enthralled and gripped so many people.Her compelling 12-lecture look at this literary masterpiece -whether it's the work of many authors or the "vision" of a single blind poet - makes it vividly clear why, after almost 3,000 years, the Iliad remains not only among the greatest adventure stories ever told but also one of the most compelling meditations on the human condition ever written. 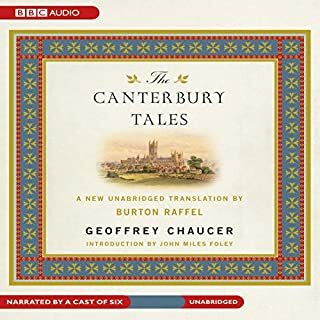 Lively, absorbing, often outrageously funny, Chaucer's The Canterbury Tales is a work of genius, an undisputed classic that has held a special appeal for each generation of readers. The Tales gathers 29 of literature's most enduring (and endearing) characters in a vivid group portrait that captures the full spectrum of medieval society, from the exalted Knight to the humble Plowman. This unabridged work is based on the new translation. Paradise Lost, along with its companion piece, Paradise Regained, remain the most successful attempts at Greco-Roman style epic poetry in the English language. Remarkably enough, they were written near the end of John Milton's amazing life, a bold testimonial to his mental powers in old age. 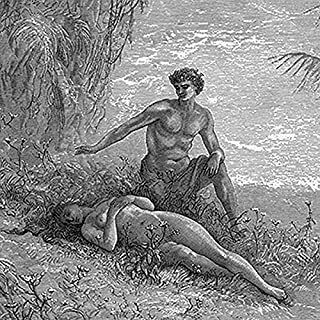 And, since he had gone completely blind in 1652, 15 years prior to Paradise Lost, he dictated it and all his other works to his daughter. The Aeneid represents one of the greatest cultural and artistic achievements of Western Civilization. Within the brooding and melancholy atmosphere of Virgil's pious masterpiece lies the mythic story of Aeneas and his flight from burning Troy, taking with him across the Mediterranean the survivors of the Greek onslaught. Aeneas, after many travails and adventures, including a love affair with Dido Queen of Carthage and a visit to the underworld to see his father, ends up in Italy. Renowned poet and critic Clive James presents the crowning achievement of his career: a monumental translation into English verse of Dante’s The Divine Comedy. The Divine Comedy is the precursor of modern literature, and this translation - decades in the making - gives us the entire epic as a single, coherent and compulsively listenable lyric poem. Written in the early 14th century and completed in 1321, the year of Dante’s death, The Divine Comedy is perhaps the greatest work of epic poetry ever composed. The epic grandeur of Dante's masterpiece has inspired readers and listeners for 700 years and has entered the human imagination. But the further we move from the late medieval world of Dante, the more a rich understanding and enjoyment of the poem depends on knowledgeable guidance. This brilliant new treatment of the world's oldest epic is a literary event on par with Seamus Heaney's wildly popular Beowulf translation. Esteemed translator and best-selling author Stephen Mitchell energizes a heroic tale so old it predates Homer's Iliad by more than a millennium. A defense of this "translation"
The publication of a new translation by Fagles is a literary event. His translations of both the Iliad and Odyssey have sold hundreds of thousands of copies and have become the standard translations of our era. Now, with this stunning modern verse translation, Fagles has reintroduced Virgil's Aeneid to a whole new generation, and completed the classical triptych at the heart of Western civilization. Led by his guide, Beatrice, Dante leaves the Earth behind and soars through the heavenly spheres of Paradise. In this third and final part of The Divine Comedy, he encounters the just rulers and holy saints of the Church. The horrors of Inferno and the trials of Purgatory are left far behind. Ultimately, in Paradise, Dante is granted a vision of God’s Heavenly court: the angels, the Blessed Virgin, and God Himself. One of the greatest works in literature, Dante's story-poem is an allegory that represents mankind as it exposes itself, by its merits or demerits, to the rewards or the punishments of justice. A single listen will reveal Dante's visual imagination and uncanny power to make the spiritual visible. ©1321 Public Domain (P)2007 Blackstone Audio, Inc. This is an excellent program, which comes mysteriously, with footnotes. The notes themselves are very useful as any reading of Dante is impossible without a third party to guide you along the first time. Many of the people he meets with along his journey are very, very obscure (not even a professor of Medieval Italian history would know them all from memory). However, the format is not always clear as to when the notes end and the text begins. I have read the Comedy more times than I can remember, but even I was momentarily confused at times as to who was speaking. I wish there was one reader for the text and another for the notes, or that the chapter breaks fell regularly between the notes and the poem itself, if nothing else, for clarity. This is an excellent recording that rectifies most of the negatives in the reviews of the other options. It's a great introduction to Dante that will either satisfy your curiosity about "The Divine Comedy" or lead you to more in-depth study afterward. Having sought a good recording of "The Divine Comedy" for some time, this recent release was welcome. Much of what one likes or dislikes about recordings of classic verse depends on the translation, the narrator, and other variables. This one worked well for me in that I enjoy the narrator (and have bought other recordings because I like his voice), that it is unabridged, and that the translation is pleasing to listen to (although it is prose and does not mimic the original's terza rima). Each cantica is preceded by an author's note about its structure; each canto has a brief narrative overview. This makes it an excellent choice for first-time readers and/or people who want to read it without devoting a great deal of study to the process. That said, many people would say that "The Divine Comedy" requires a great deal of study,and that a footnoted, print edition is requisite. (I think not, depending upon one's interest, but some of the structure notes -- and biographical references -- would be more accessible in print.) It is perfectly listenable and one need not take a course to grasp the main points and see how it influenced later literature. My only complaint -- and this is because I listen to several classics over and over -- is that there is no convenient way to listen to it from start to finish without the cantica and canto introductions. After one understands the processions, listening to just the verse would be a nice option. I really like the narrative and reading - it's very flowing and well-done. It is true that each Canto leads in with a quick summary as to what is about to happen - and I found these very helpful as a listener, but it would have been more helpful if it were easier to tell the difference between the reader's "summary voice" and "reading voice". There IS a difference between his inflections, but it's VERY subtle. 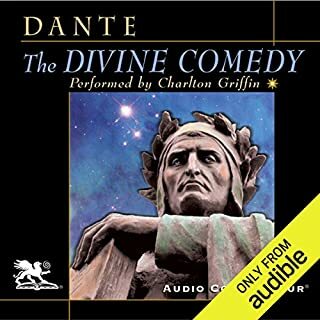 Overall, though, I really like this audio book version of The Divine Comedy and feel like the two parts together were worth the two credits. I had no problem with the transition from Canto synopsis to the Canto itself. The style of language is very different and the narrator/reader does pause. I found this recording very satisfying. My complaint about most audible products is the difficulty to find a specific point in the text. For example, where does Canto 17 start? I suggest giving readers a separate text index of what time Chapters, Cantos, and Tales start. Even if one knows the text, finding a chapter is hit and miss. What about Ralph Cosham’s performance did you like? He read like he was telling a tale, rather than reading a book. It takes a little effort for a modern reader / listener to understand the old fashioned language but his pace is the perfect balance. He's slow enough that you are able to process and understand but not so slow that it's condescending or dragging. He clearly understood what he was reading and used inflection masterfully to help convey emotion, meaning, and intention. Some other reviews complained about the reader adding in descriptions. This is how the Divine Comedy is written by Dante. If you're looking to add the Divine Comedy to your cannon you can't go wrong with this performance. If you could sum up The Divine Comedy in three words, what would they be? This is an absolutely wonderful prose to begin with and then you add the narration WOW! This exemplifies there the Narrator is all-important; Loved his reading style. This is classic Christian poetry at its finest, but requires a high level of focus to really absorb. Cosham did a good job narrating, but not great, (came across a bit dry and monotonous at times) but in all fairness bringing this ancient text to life is the highest level of difficulty. I found it deeply enriching and a fascinating look at the old world. In between every canto the reader narrates a description formed form outside the text to let the reader know what is going on. What's amazingly annoying is that the reader don't give you any clue as to when he is reading the test directly as compared to the analysis. Also the narrator don't have a suitably fluid voice to be reading one of the six greatest written works of all time. What did you like most about The Divine Comedy? It's the Divine Comedy. Its extremely well translated, I don't know how much is lost in translation. Certainly the rhyming structure so it stops being a poem and becomes prose but I didn't care about that. Which character – as performed by Ralph Cosham – was your favourite? He doesn't really have characters, just Dante and he did a good job, if a tad monotone. Laugh and go how the *beep* did he get that past the pope. Extremely frustrated with the canto structure. Explanation of the canto then the canto then another explanation. kills the momentum. but stick with. What made the experience of listening to The Divine Comedy the most enjoyable? Somewhat split emotions when it comes to this book. Overall all three books would get a 6/10 and I could only recommend all if you really enjoy the first part. I persisted with this until I just had to give up after around eleven hours. I would have found it more interesting and more easily understandable if the explanations on each upcoming canto had either been read by a different person or at least in a different manner from the actual canto itself. I found it difficult at times to know whether I was listening to the that written by Dante or the interpretation of his meaning. In the end, the performance just became so monotonous that I couldn't get to the end. I would not recommend this. The narrator sounds as if he has a bad cold. Would you be willing to try another one of Ralph Cosham’s performances? Justice is described deep and swift, especially for greed and avarice. Faith in the unknown, infinity and ultimate goodness afirmed. The need to persevere in good works according to an inner light of love, even though rejected by the establishment explored. The punishments appalling. Warranted? They are without hate... Useful? I am too small an intellect to know.